William Thomas Gadd was born in Yeovil on 11 January 1880. He was the youngest of the six children of glove cutter Henry Gadd (1840-1924) and Jane née Legg (1843-1927). In the 1891 census the family were living in Landsdowne Terrace, Vincent Street (which still survives). William moved to Guildford, Surrey, and in the spring of 1901 he married Ellen (known as Nellie) Seymour (1878-1958) at Guildford. The 1901 census listed William and Nellie as lodgers at 49 Church Road, Guildford. Their son Percy Reginald Seymour (1901-1966) was born later that year and their daughter Elsie Freda (1910-1995) was also born in Guildford. William gave his occupation as a printer. The 1911 census found the family living at 8 Margaret Road, Guildford and 31-year old William gave his occupation as a printer's machine minder. William enlisted at Guildford, probably during the late spring or early summer of 1917. He became a Private in the 12th Battalion, Royal Sussex Regiment (2nd South Downs). His Service Number was G/19950. He was soon sent to France and most likely took part in the Battle of Langemarck. This engagement, from 16 to 18 August 1917, was the second Allied general attack of the Third Battle of Ypres. The Allied attack succeeded in the north, from Langemarck to Drie Grachten ("Three Canals") but early advances in the south on the Gheluvelt Plateau were forced back by powerful German counter-attacks. Both sides were hampered by rain, which had a greater effect on the British who occupied lower-lying areas and advanced onto ground which had been frequently and severely bombarded. The Battalion next took part in the Battle of the Menin Road Ridge (20 to 25 September 1917). This battle marked a change in British tactics during the Third Battle of Ypres. The first part of the battle had been commanded by General Sir Hubert Gough (Fifth Army). That choice had forced a delay of six weeks while the Fifth Army moved into place, replacing General Herbert Plumer’s Second Army. Gough had performed no better than earlier commanders on the Western Front. The Germans had perfected defence in depth. Their front lines were lightly defended. Behind the front line scattered German strong points disrupted any Allied advance. Once the British or French attackers were disorganised, the Germans would launch a counterattack with specially trained divisions kept out of range of Allied artillery. A series of Allied attacks on the Western Front had penetrated the German front line but failed to get past the second. In the aftermath of the earlier failures at Ypres, Plumer suggested an alternative plan – his “bite and hold” strategy. This was designed to use the German plan against them. The British would pick a small part of the front line, hit it with a heavy bombardment and then attack in strength. The advancing troops would stop once they had penetrated 1,500 yards into the German lines. At this point they would have overrun the German front line and perhaps some of the strong points behind the lines. The attacking troops would then stop and dig in. When the German counterattack was launched, instead of finding a mass of exhausted and disorganised men at the limit of the Allied advance, they would find a well organised defensive line. Plumer was given permission to try his new plan, and three weeks to prepare. His men received detailed training. The battle began with a creeping barrage 1,000 yards deep, which protected the attacking infantry. The British attacked with four divisions – from north to south the 2nd Australian, 1st Australian, 23rd and 41st Divisions. The attack was a great success. The majority of Plumer’s objectives were captured on the first day of the attack, only the 41st Division needed to follow up on the following day. German counterattacks were repulsed the first and second days of the attack. William Gadd was killed in action on 23 September 1917 during the Battle of the Menin Road Ridge. He was 37 years old. 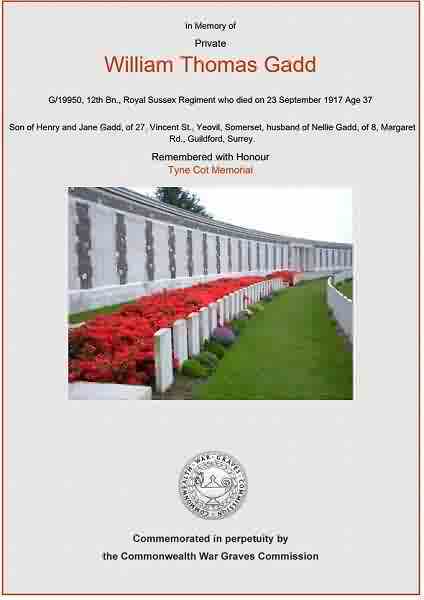 William is remembered on Panel 86 to 88 of the Tyne Cot Memorial and his name is inscribed on the War Memorial in the Borough. 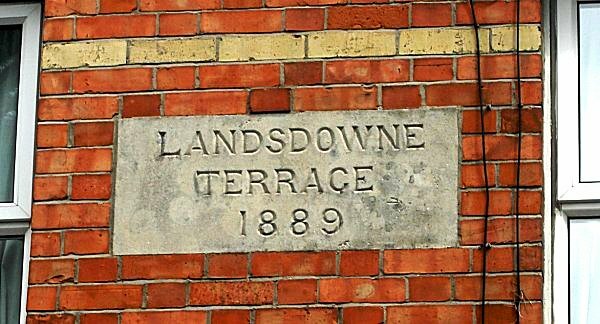 The Landsdowne Terrace datestone mentioned above. Photographed in 2013. The Commonwealth War Graves Commission certificate in memory of William Gadd.